Mossley Hill Archery Club is a small section of the parent club, Mossley Hill Athletic Club situated in a leafy suburb of South Liverpool. We can be found on the Field of Hope, to the rear of the parish church. 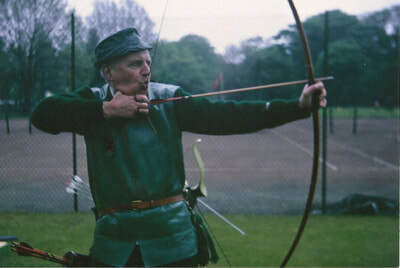 The club was formerly known as Liverpool Archery Club and was founded in 1949, joining Mossley Hill Athletic Club in 1960, and incorporating in 1974. ​1781: March, Mersey Bowmen founded. If this club had not dropped archery, in favour of tennis, it would be the longest existant archery club in this country, and older by a month than the Royal Toxophilite Society. 1861: G.N.A.S. founded in Liverpool at a meeting held in the Adelphi Hotel. 1949: May, Liverpool Archery Club founded, the shooting grounds were at Earle Football Club, Church Road. Wavertree, following a proposal by Mr F. Pugh. Elected officers, Mr George Horn as Chairman, Mrs Barbara Ruston, Secretary and Mr B.A. Fell as treasurer. Fees £1p.a. 1951: L.A.C. badge designed. Mr. E. H. Hawksley sets British national record for a St. George round with a score of 489. 26 members. 1952: club coach elected Mr Ernest Handcock. 1953: club tassel designed and registered, green and red quartered with silver cord. 23 members. Southport Archers invite clubs to shoot the Frost-Bite round, adopted by the British Archer magazine, and still shot for as a monthly postal match during November to March. 1954: Robb Wilton cup instituted for Gents championship, to honour their president, purchased by the membership. Robb Wilton was a renowned comedian of music hall, radio and screen. He was a regular at the Black Bull pub, Gateacre, which the club used as their ‘gathering place’ and at which they shot indoors over the winter, and used the gardens for short range shooting during the summer. The Landlord was a Mr George Formby, (not the ukulele player) who donated a shield which the club still shoots for. Liverpool Arrow donated to M.A.A. 1955: York round selected as the Gents championship round. 1957: Grounds moved to University fields at Wyndcote, Mossley Hill. Robb Wilton dies, new president Mr James Pownall C.C. 1958: Rodney James Fleming (Jim), sets British national record for a Windsor round 108-858-61, and Short Western 95-763-58. 1959: Ground move to Oak Farm, Springwood Avenue, Allerton. Jim Fleming awarded the Worshipful Company of Bowyers medal. 1960: ground move to Mossley Hill Athletic Club. 1961: Jim Fleming, shoots for British Team, team 2nd individual 8th. Bill Wales wins the Scorton Arrow. The Scorton is the oldest competed for sporting trophy in the country, 1673. 1963​: fees held at £2-10-0.p.a. 1964: a beginner’s bow purchased. 1965: due to ongoing problems, new members were to be informed that they are under ‘an obligation’ to assist in the putting out, taking in and maintenance of equipment. 1966: two members qualify as ‘instructors’. Ron Sheil wins the Scorton Arrow. An error on the part of the previous year’s winner, in not retuning the Arrow to the meeting, led to a decision that in future the Arrow must ‘remain in Yorkshire’. 1967: members objected to the proposed increase in national fees by the G.N.A.S. in an attempt to cover the envisaged cost of their ‘two year crash programme’. 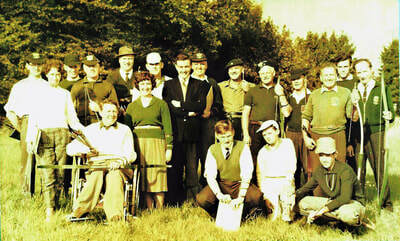 There had been a depletion in membership following the paraplegic members joining a specialised club for their needs. 1968: a complaint received from Southport relating to the length of grass on our shooting area. 1969: vandals break into the storage room and cause damage. Balance sheet down to £8-3-10d. Mossley Hill Athletic Club start a ‘pavilion fund’. 1970: further vandalism to the club. A depletion in members. 1971: fire in club room, and all equipment stolen. 1972: M.H.A.C. introduce 'nominated and seconded proposed' membership forms. 1973: indoor venue secured at Vernon Sangster Sports Hall, Everton. 1975: hosts the Merseyside Archery Association annual championships. Mrs. J. Worthington, the wife of the M.H.A.C. chairman is invited to be ‘lady paramount’. Rod Lyons makes his first longbow. 1976: membership 29. A new trophy is donated by Mr Ralph Goldman to replace the displaced Pownall Rose Bowl. 1978: depletion of members due to loss of juniors drifting into university and work life. Five members obtain ‘instructors’ certificates. 1980: range orientation changed from south/north to north/south. Distance pegs set in ground. Postal match held with Oakleigh City Australia (no return score received). 24 members. 1981: Nick Brace chosen to attend pre-Olympic training. Pam Strettle and Lance Burn attain their Master Bowman classification. 1982: chairman Mr Nick Brace. Constitution changed so as to ‘hold committee meetings as and when required’. Fall in participation of domestic shoots. 1983: concerns raised at lack of coaching at Wednesday’s club nights. Rod Lyons was Lancashire Gents Recurve Champion, winning the Liverpool Arrow. 1984: concerns raised that the section were becoming insular to main club, and that not enough use was being made of the range, risking other users to take over. Catering facilities introduced within the main club. 1985: donated trophy and introduction of ‘highest aggregate’ Frost-Bite score award. First winner Mr Rodney Lyons with a score of 1564. 1986: hosts M.A.A. annual championships. Continued concern for lack of use of the range. 17 members. 1987: unbeaten in the British Archer winter postal league. Stephen Franklin wins M.A.A. junior indoor championship. 1988: Pam Strettle wins Lancashire indoor championship. Pat Prentice 3rd place at National indoor championship. 25 members. 1989: metal container obtained for storage. Winners of M.A.A. summer league. 26 members. 1990: tennis section presents a scheme to take over part of the range, scheme proves to be non-viable. Shooting line paved. Pam Strettle gains M.B. classification. 1991: winners of M.A.A. summer league and British Archer winter postal league. Pam Strettle 1st and Allison Hanton 3rd and Matthew Kennerley 1st junior at M.A.A. indoor championships. 29 members. 1992: Mr Larry Kinrade elected as Honorary Member for his services to the section over many years. Compound team entered for B.A. winter leagues. 1993: indoor venue secured at the Liverpool Metropolitan Cathedral, via Mr Barry Redden. 29 members. 1994: John Whitfield dies. Team event 1st at S.A.M.P.A. field archery tournament. Club Captaincy protocol dropped (the winner of the gents championship becomes club captain) due to multi bow styles being used. 1995: donation and introduction of a Longbow trophy to honour Mr Rodney Lyons. 1996: 14 longbows enter trophy shoot, winner Mr John Woollam. 1997: combining of trophy shoots to condense calendar. 1998: Caroline Jobson and Barry Marsden secure 9th and 10th places in the National field rankings. Pam Strettle and Barry Marsden selected for the English team squad. 39 members. 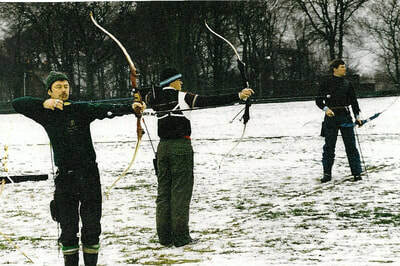 1999: celebration of the 50th anniversary of the foundation of Liverpool Archery Club and the 25 anniversary of the integration into M.H.A.C. Mr Mark Halliday wins three indoor championships, M.A.A., Lancashire and North Wales. 2000: portrait gallery presented to celebrate the 50th anniversary of the founding of LAC and the 25th anniversary of its incorporation into MHAC. 2002: introduction of novice mentoring. 2003: Child Protection Officer, appointed. 2004: Fees £40 sen. And £20 junior. 2005: adoption of new ‘club’ colours maroon and gold tops with black trousers or skirts. 2006: fees £45 sen. and £20 junior. 2007: two members qualify as level1 coaches, Mark Murphy and John Woollam. 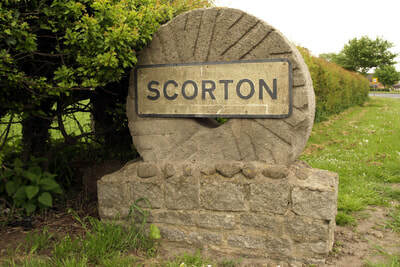 2008: 300th recorded shooting for the Scorton Arrow, three members Rod Lyons, Vincent Ng and John Woollam attend the event, which was held at Scorton village, Yorkshire. 2009: Caroline Jobson, placed 2nd at the British Field Championships. Mark Halliday wins Northern Counties Field Championships, in Compound Unlimited class. 2010: initial plans for bowling green rejected. 2011: new lease signed by the city Council for 25 year period. John Woollam wins the English Field Archery Bare-Bow championship, and the Northern Counties title. 2012: John Woollam sets three Lancashire Bare-Bow field records, 24 Un-marked, 307, 24 Marked, 280, and 24 Combo, 562. Mark Murphy qualifies as level 2 coach. 2014: John Woollam sets a Lancashire Bare-Bow indoor record, Stafford, 620. 2015: John Woollam sets a Lancashire Bare-Bow indoor record, FITA 25, 514. Mr Rob Monaghan registered as a Level 1 coach. 2016: membership 50. Fees £90 senior and £ 25 junior. Pressure put on shooting line capacity. 2017:Archery GB, requires grounds to be ‘registered’. Two new level one coaches registered Mrs Dianne Sorensen and Mr Aaron Cunliffe. 47 members, 37 senior and 11 juniors. 2018: A year spent consolidating the membership and saw the introduction of a student membership. The Strawberry Shoot was reintroduced in to the shooting calendar.